Summary of responses to a consultation on a possible producer responsibility scheme for non-packaging agricultural plastics (NPAP) published. The Department for Environment, Food and Rural Affairs, along with the Welsh Assembly Government and the Scottish Government today published the summary of responses to a consultation on a possible producer responsibility scheme for non-packaging agricultural plastics (NPAP) and announced that they will not be proceeding with a statutory collection scheme. Each year 45,000 tonnes of NPAP, such as silage wrap fleece plant jackets, mulch film and polytunnel and horticultural covers, is sold in the UK. Once used it creates around 85,000 tonnes of waste plastic, mainly due to contamination by soil which makes it more difficult to recycle. In 2004/2005, as part of the work on introducing the Agricultural Waste Regulations, Defra consulted on how best to increase the amount of waste non-packaging agricultural plastic that is recycled, and the responses supported work to develop a statutory producer responsibility scheme for the collection of this waste for farmers. In developing these options, Defra worked closely with Advisory Group on Farm Plastics (AGFP) and the Agricultural Waste Programme, who were set up in 2005 to look at the costs and benefits of a scheme and the structure of a possible system. an introduction of a statutory producer responsibility scheme with free-at-the-point-of-use collection points. The consultation closed last February and took account of current market developments, varying views on the levels of recycling levels of this waste stream, the awareness of farmers and the levels to which they dispose of this waste legally and the increasing availability of collection services throughout the UK. Ministers have decided that no Government intervention is needed, a view supported by the majority of responses to the consultation as the scheme would cover only a small waste stream and the costs and administrative burden on businesses of any scheme could be disproportionate to the environmental benefits that would be achieved. The consultation attracted 41 responses from businesses and trade associations and local authorities. The vast majority of respondents (28) did not wish to see any Government intervention. Nine supported Option C: Introduction of a statutory producer responsibility scheme with free-at-the-point-of-use collection points. Two did not state a preference. Prior to the introduction of the Agricultural Waste Regulations (AWR) in 2006, approximately 80% of agricultural plastic waste products were disposed of by burning or burying on farms. Farm plastics is a generic term used to describe a variety of plastics used by agricultural businesses. There are two sub-groups of farm plastics: Plastic Packaging, and Non-Packaging Agricultural Plastics (NPAP). The full membership list for the industry-led Advisory Group on Farm Plastics (AGFP) include representatives from; the National Farmers’ Union (NFU), Norvic/Unterland/Mondi, British Polythene Industries, Total Polyfilm Ltd, Tubex Ltd, Singleton Agriculture, Agritel, Norvic, UAT Ltd, UPU Industries, Capatex, Linpac, Biffpac, CIWM (EB), Defra, Scottish Government, Welsh Assembly Government, Department for Business, Industry and Skills, Department of Environment Northern Ireland, VALPAK, Environment Agency, Scottish Environment Protection Agency. 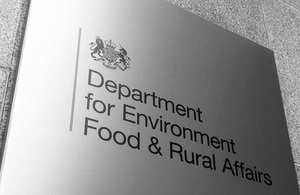 On 15 June 2010, the Secretary of State for the Department for Environment, Food and Rural Affairs the Rt Hon Caroline Spelman MP announced that the Government would undertake a full review of waste policy. It will cover all aspects of waste policy and delivery in England.